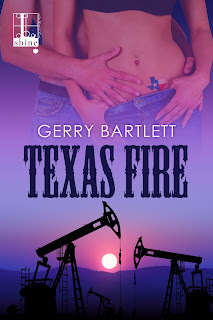 Dog Eared Publicity: Cover Reveal: Texas Fire by Gerry Bartlett, coming November 15! Cover Reveal: Texas Fire by Gerry Bartlett, coming November 15! Megan Calhoun doesn’t stick with anything long. She’s the daughter of a billionaire—why pretend to be somebody else? Until she finds out her father’s will says she has to. She has to last a year in the oil patch, in the dust and heat of West Texas, working for her daddy’s company. Otherwise she’s cut off without a cent—and no way to earn one. The only upside is her new pal Rowdy Baker, ex-football star, Calhoun engineer, and grade-A stud. If she has to live in a trailer, his doesn’t sound so bad. Rowdy knows the roughnecks running the rigs won’t take kindly to a smartass blonde rookie whose last name matches their paychecks. He can’t control his attraction to her. And with everyone from the foremen to the stockholders spitting mad at the Calhouns, he expects trouble ahead. Gerry Bartlett is the nationally bestselling author of the REAL VAMPIRES series, featuring Glory St.Clair, a curvy vampire who was bloating when she was turned in 1604. Gerry is a native Texan and lives halfway between Houston and Galveston where she has an antiques business that lets her indulge her shopping addiction. You can see her purse collection on Pinterest. Would she like to be a vampire? No way. She's too addicted to Mexican food and sunlight. You can reach her on http://gerrybartlett.com or follow her and her dog Jet on Facebook, twitter or Instagram. Her latest release is REAL VAMPIRES SAY READ MY HIPS (Real Vampires 11) available now.